We’re really excited to announce Tweetlevel has been selected by MTV to help the network and ZYNC from American Express find the first MTV TJ ‘Twitter Jockey’. You can follow the competition on zync.mtv.com! 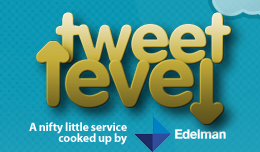 A unique tool created by Edelman – measures an individual’s importance on Twitter. * Influence – what you say is interesting and many people listen to it. This is the primary ranking metric. Flexamail – Make mail do more!